Exodus 20:4, "Thou shalt not make unto thee any graven image, or any likeness of any thing that is in heaven above, or that is in the earth beneath, or that is in the water under the earth:"
Exodus 20:5, "Thou shalt not bow down thyself to them, nor serve them: for I the LORD thy God am a jealous God, visiting the iniquity of the fathers upon the children unto the third and fourth generation of them that hate me;"
Leviticus 26:1, "Ye shall make you no idols nor graven image, neither rear you up a standing image, neither shall ye set up any image of stone in your land, to bow down unto it: for I am the LORD your God." Acts 25:19, "But had certain questions against him of their own superstition, and of one Jesus, which was dead, whom Paul affirmed to be alive." The Angels were more concerned with us gazing unto the place were Jesus lay, than the place where He hung! "The Pope is not only the representative of Jesus Christ, he is Jesus Christ himself" -Catholic National July 1895. Romans 1:25, "Who changed the truth of God into a lie, and worshipped and served the creature more than the Creator, who is blessed for ever. Amen." The Catholic church declares that all should pray unto Mary, Joseph, Therese, and hundreds of other saints. The Catholic church even goes so far at to declare Mary as your Saviour! 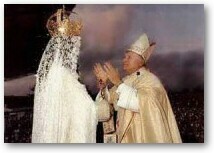 May 7, 1997 (David W. Cloud, Fundamental Baptist News Service, 1701 Harns Rd., Oak Harbor, WA 98277) - On May 7 Pope John Paul II dedicated his general audience to "the Virgin Mary" and urged all Christians to accept Mary as their mother. He noted the words spoken by Jesus on the cross to Mary and to John-- "Woman, behold thy son!" and "Behold thy mother!" (John 19:26,27), and he claimed that in this statement "IT IS POSSIBLE TO UNDERSTAND THE AUTHENTIC MEANING OF MARIAN WORSHIP in the ecclesial community ... which furthermore is based on the will of Christ" (Vatican Information Service, May 7, 1997). However, Jesus said rather plainly... John 14:6, "Jesus saith unto him, I am the way, the truth, and the life: no man cometh unto the Father, but by me." 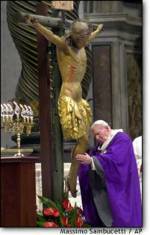 "You must keep them upon you, with a crucifix. We demand a crucifix. Directives from Heaven From the vision of "-Jesus, June 18, 1987." The Pope himself stated in 1981, "When Pope John Paul II was shot and operated on in 1981, he told doctors not to remove the brown scapular he was wearing. 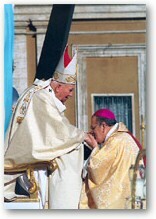 One of the two 'most recommended' devotions of the Church..." Pope John Paul is convinced that Our Lady of Mount Carmel, along with Our Lady of Fatima, saved him from the bullets of Mehmet Ali Agca [See Inside the Vatican, July 2001, page 44]. 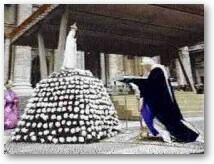 "The Virgin Mary appeared at the final apparition of Fatima (Portugal) and at Lourdes (France), wearing the brown scapular. 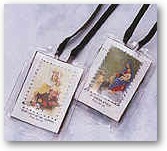 The pontiff, a Third Order Carmelite, has worn the scapular of Our Lady of Mount Carmel since he was a young boy. 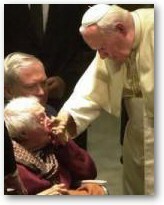 He frequent asks Our Lady of Mount Carmel to help him make important decisions." -Vatican Magazine. 1st John 4:1, "Beloved, believe not every spirit, but try the spirits whether they are of God: because many false prophets are gone out into the world." Acts 17:24, "God that made the world and all things therein, seeing that he is Lord of heaven and earth, dwelleth not in temples made with hands." 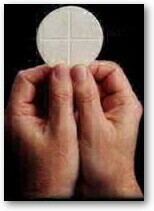 "If anyone denies that in the sacrament of the most Holy Eucharist (communion wafer) are contained truly, really and substantially the body and blood together with the soul and divinity of our Lord Jesus Christ, and consequently the whole Christ, but says that He is in it only as a sign, or figure or force, let him be anathema." (One exhausted definition of "Anathema" = To be damned and put to death) Canons and Decrees of the Council of Trent. Original text with English translation, by Rev. H.J. Schroeder, O.P., B. Herder Book Co. 1960, p.79, Canon 1. Acts 7:48, "Howbeit the most High dwelleth not in temples made with hands; as saith the prophet." Soon to be worshipped in bronze! 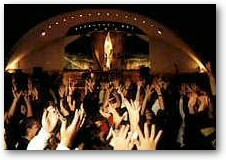 This looks like worship to me! Jacob's uncle (Rachel and Leah's father) was Laban. Laban was an unsaved heathen who worshipped idols, which the Bible calls gods in Genesis 31:32. When Jacob departed from Laban after 20-years of servitude, Rachel stole Laban's idols. The Bible calls these idols “gods,” for they were Laban's gods. That is very interesting. 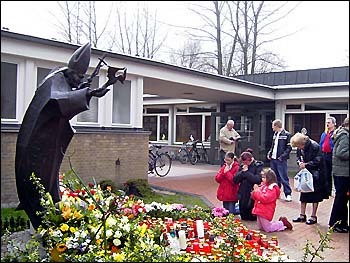 Catholics worship gods—statues of Mary, the Queen of Heaven, Our Lady of Fatima, Our Lady of Guadalupe, Saint Anthony, and many others. 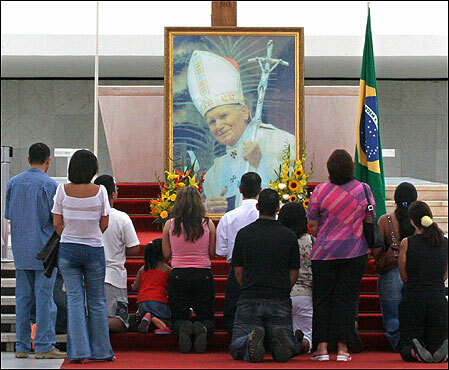 They worship the Image of Divine Mercy, bowing and praying in idolatry to their gods made of stone, plastic, marble, gold, and wood. The Catholic Church is a prisonhouse of religion, worshipping a host of idol gods; just as did wicked Laban. The word idol does not appear in the Old testament Genesis 35:2, “Then Jacob said unto his household, and to all that were with him, Put away the strange gods that are among you, and be clean, and change your garments.” Here again we see a Biblical reference to idols as “gods.” The word “gods” is found 207 times in the King James Bible's Old Testament. Jacob said, Not in my house! Amen and amen! We find the word “idols” 89 times in the Old Testament. Idols are false gods. 2nd Kings 17:12, “For they served idols, whereof the LORD had said unto them, Ye shall not do this thing.” Oh listen to me you Catholics, you need to come to the true and living God! 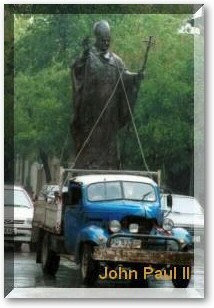 The idea that God can be reached through a statue of Mary is despicable idolatry. 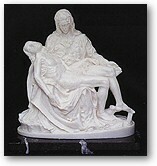 Catholics repeatedly quote John 19:27 (“Behold thy mother!”) in a sinful attempt to exalt Mary. Catholics claim that Jesus identified Mary as everyone's mother. However, Jesus also said in John 19:26, “Woman, behold thy son!” So is John everyone's son? This evidences just how ridiculous and lame Catholic indoctrination really is. They have no Biblical basis for their manmade heresies fabricated down through the centuries.